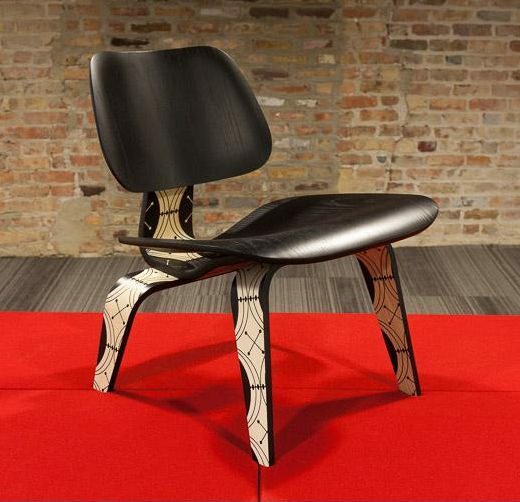 For a charity auction sponsored by Thomas Interior Systems, HPA transformed the iconic Eames Molded Plywood Chair into a celebration of the architectural legacies of Louis Sullivan and Charles and Ray Eames. Designers from HPA’s Interiors Group were inspired by Sullivan’s pioneering of the Chicago skyscraper and Ray and Charles Eames’ experiments with molded plywood. In HPA’s interpretation, the chair’s elegantly shaped spine and legs were highlighted with a pattern from Sullivan’s Chicago Stock Exchange. Partnering with HPA on the project, Columbia Model and Exhibit Works donated their fabrication resources to laser cut and sandblast the design. The auction was held in tandem with Thomas Interiors’ opening of its new downtown Chicago office on February 20, 2014. More than a dozen local architecture and design firms contributed their designs, with proceeds benefitting the families of fallen Chicago Fire Department firefighters.